In principle, Germany is a state committed to democracy and international peace. This is why three recent political scandals, which exposed the vulnerability of German citizens to the surveillance institutions of their state as well as the development of drones, came as a surprise to many. A demonstration against PRISM in Berlin. Wikimedia Commons/Mike Herbst. Some rights reserved. In the summer of 2013, three scandals have shone a new spotlight on the role of the German state in both domestic and international surveillance. The first was the case of the American National Security Agency (NSA) spying on the mobile phones of millions of German citizens. The NSA spying scandal exposed the messy state of Germany’s domestic security/privacy issues. The second summer debacle - the Euro Hawk drone scandal - revolved around the use of surveillance technology to ensure the external security of the German state. The third scandal took place in the fall - revelations about the spying of Merkel’s personal mobile phone brought once again the issues of security, consent and dignity to the forefront of public discussion. Yet, while the breaches of individual privacy and personal consent as a result of unauthorized and non-consensual mass surveillance generated a very strong public response, the surveillance drone debacle has now quietly left the newspapers’ front pages. As we shall see, this is revealing of differing German attitudes towards the surveillance state. The scandals are all the more disquieting because they have uncovered that underneath the calm surface of Germany’s economic prosperity, there are deep and worrying fractures. Mapping these fractures requires reflecting on what each of these scandals has revealed about the relations between the state and its citizens. Each of these security misconducts has also underlined a new form of social control, unmasking different facets of a new global phenomenon – the emerging surveillance state. Two recent domestic surveillance scandals lifted the curtain on the making of Germany’s surveillance state. October 2013 marked the onset of the most recent scandal, with news of the US surveillance of Chancellor Merkel’s mobile phone hitting the front pages. The issue was further aggravated by the fact that not only calls concerning the affairs of the state, but also personal calls of Chancellor Merkel had been intercepted for months. The scandal caused public uproar, a special Bundestag session, and the launch of a parliamentary inquiry. The US Ambassador to Germany was summoned by the German Ministry of Foreign Affairs for an explanation, and observers duly noted that it was the first time this had happened since the end of World War II. Fresh evidence of surveillance/security misconduct also fanned public criticism of the authorities, which were accused of having all too quickly closed down the summer NSA spying case. Many felt duped and outraged by what was now perceived as excessive haste in hushing down a rising scandal. In the summer of 2013 the NSA spying scandal erupted as a result of revelations that Germany has been playing a central role in the NSA's global surveillance network. The events snowballed in early June, as Edward Snowden leaked the first classified documents. Snowden‘s leak revealed that millions of communication messages from Germany had been accessed by the NSA’s Global Informant programme. Such revelations showed ‘the possibility of the absolute surveillance of a country's people and foreign citizens without any kind of effective controls or supervision,’ as Der Spiegel pointed out. Wide-spread public criticism was aimed at the Bundesnachrichtendienst (BND), the German intelligence agency, when it was revealed that it had collaborated with the NSA and GCHQ by sending them millions of pieces of metadata every month. The possibility that mobile phone information sent to the NSA was later used to conduct drone attacks in the Pakistani region of Waziristan in October 2010 led to even more public concern. Der Spiegel also revealed that the NSA maintains a cryptology center in Griesheim, near the city of Darmstadt; the center is, in the NSA’s own words – ‘the largest intelligence analysis and production unit in Europe.’ As Der Spiegel pointed out, ‘the NSA also reportedly has operations at the Mangfall military base, in the Bavarian town of Bad Aibling, and in Wiesbaden, in the central German state of Hesse. Yet the German government allegedly knows nothing about any of this’. So much for the domestic security scandal. But the eventful summer of 2013 also set the scene for another scandal, this time about Germany’s external defence capabilities - the troubled procurement of the Euro Hawk surveillance drone. Mention of ‘drones’ evokes American military campaigns, rather than the dusty ministerial offices of the German capital. Yet, reports on the rise and fall of a German surveillance drone caught the avid attention of the German and European publics. The public learnt with astonishment that for 13 years Germany had a surveillance drone programme going on – resulting in little accountability even if the drone’s flying problems were universally acknowledged. Back in 2001, during Chancellor Schroeder’s time, members of the Social Democrat-Green Party coalition government put their heads (and money) together to develop the Euro Hawk, a variant of the US-developed Global Hawk, a spy drone, built by the American company Northrop Grumman. The result of the cooperation between Northrop Grumman and Europe’s EADS, the Euro Hawk was supposed to enhance the surveillance capabilities of the German military and support NATO’s Alliance Ground Surveillance system. But the project was quickly abandoned. In 2004, the Bundeswehr flexed its military and monetary muscle, and asked EADS and Northrop Grumman to come up with an offer for the development, production, and delivery of a Euro Hawk. In the following year EADS and Northrop Grumman founded a dedicated venture, 'Euro Hawk GmbH.' The two founders presented their bid in December of the same year, although there was little public communication about the project. In 2007, with the conservative government of chancellor Angela Merkel in office, the contracts were signed. Two years later German military inspectors voiced concerns about potential flight permit issues. However, following pressure from Karl-Theodor zu Guttenberg's Defense Ministry, a military inspector eventually carried out the necessary tests to enable the provision of temporary flight permission. The Euro Hawk zipped across the Atlantic in a 22 hour trip from USA to Germany in 2011. When it was brought back to Europe, however, the German Defence Ministry under then-minister Thomas de Maizière ‘discovered’ that permanent flight permits would cost an additional 500 to 600 million euros. The end of the Euro Hawk saga came in 2012, when de Maizière stopped the drone project, because of very significant problems in obtaining flight permits for European airspace. The Defence Ministry confirmed its decision to suddenly halt the Euro Hawk programme - a very costly decision. But the story doesn't stop there. This series of scandals highlighted important issues with regards to relations between the citizens and the state. The first set of issues, which surfaced in reaction to the misconduct of public officials, concerns the link between government transparency and legitimacy. The second set of inter-related issues concerns the 'security, consent, dignity dilemma', that is characteristic of the relations between the citizens and the state. Government transparency is essential for the legitimacy of a democratic state. Yet the opaque character of public officials and their misconduct under investigation raised additional concerns – both about their lack of competence and their limited accountability to the public. In the case of the NSA-spying scandal, the then-chancellery minister Ronald Pofalla was called before a Bundestag committee, wherein he referred to the solemn statements of the US and British intelligence agencies that no laws had been breached. Pofalla next added that the BND and the NSA had agreed on pursuing a brand-new "no-spy pact." The public was quick to rumble the fact that the sudden establishment of such a no-spying agreement implied that espionage has been allowed up to now. Yet, Pofalla managed to prevent any more exposure on the issue - the Chancellery chief declined to take any questions and exited without saying anything else. The true extent of US data surveillance has remained unclear and hardly any of the allegations have been credibly refuted. The haughty attitude sported by Pofalla subjected him to wide-spread public scorn and ridicule, but incurred no official reprimands. As for the ‘Euro Hawk debacle’ the German Bundestag launched a formal inquiry in June, and Defence Minister de Maizière was asked to justify his actions. Yet at the formal Bundestag hearings the Minister repeatedly made false statements about a key question. Thus he bid farewell not only to the Euro Hawk programme, but also to his reputation for being a capable and unpartisan bureaucrat. Calls for de Maizière’s resignation were made, but he managed to cling to his post until the September elections. In both cases powerful public servants seemingly forgot overnight that their first duty is to act at the service of the public, in its best interest; even more - they eluded accountability for their actions. Government transparency would have ensured at least some democratic oversight on the powerful surveillance institutions. Achieving such democratic oversight is a considerable challenge, and one that raises the old questions about the role of representative governance and the relations between the citizen and the state. The prime target of surveillance both domestic and extra-territorial is the citizen. If you are concerned with state surveillance, it shouldn't make a difference if a German citizen is spied on by his own government, or if a Pakistani is followed around – and maybe even killed - by a German drone. However, the public reaction to the NSA spying scandal and to the Euro Hawk scandal has been different. 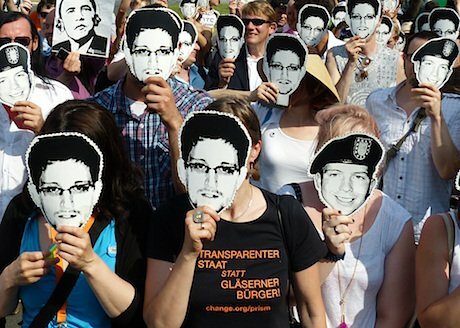 Throughout Germany, thousands of citizens took to the streets to protest against NSA spying. The Euro Hawk programme, with its huge costs and shady procurement procedures, also caused public outrage. Yet in that case the thousands of citizens did not take to the streets. Why not? It is important to mention that while the costs of the drone procurement have been well publicized in an ‘every penny counts’ manner, initiatives such as the ‘Name the Dead’ campaign of the Bureau of Investigative Journalism have not been able to claim the media spotlight to present a more humanitarian argument. The ‘Name the Dead’ project records the names of people reportedly killed by CIA drone strikes in Pakistan. In the words of Hamit Dardagan, co-director of the Every Casualty campaign: ‘Casualty recording is a way of recognising the humanity of people who have been killed, and making not just their death but also the manner of their death part of the public record – which is important if one is to prevent these kinds of deaths happening again’. In matters of national defence every penny clearly counts, but does not every person count as well? Could this then explain why the denial of citizen privacy was seen as more against the principles of the German state than the surveillance drone acquisition debacle? Judging by the public reaction, ‘being watched’ takes precedence over concern about ‘watching the others’ without the others’ permission. But as Jens Jansen warns, ‘Today the Bundeswehr fights in six theatres of conflict and our armories come third in our global exports. "Shut up, that secures jobs." But only if you're young enough or stupid enough to forget the lessons of past wars and corpses’. It is also interesting that the public and media did not consider the primarily domestic ‘NSA Spying scandal’ and the external security-related Euro Hawk scandals as two issues that were linked. The questionable actions of the German political establishment also did not translate into a penalty vote at the polls, and neither did they incite some lasting new forms of political mobilization. The apparently unaccountable officials raised public ire, but the CDU/CSU got the lion’s share of the vote in the last election, mostly thanks to Germany’s successful economic performance. These recent scandals have revealed how defenceless citizens - even those as powerful as Chancellor Merkel - can be in their relations with the institutions tasked with public protection. In the socio-political nexus of 'security, consent and dignity' of the modern states, the preoccupation has often been public security, rather than the citizens’ dignity. However, citizens' consent is the vital and essential linkage between the two, a connection that must never be broken, because without human dignity the surveillance state would be left with nothing to protect. The fight for consent is perhaps the start of a wider movement against state surveillance which will have, the way things are heading, to be truly global.